Village signs is a series of caches based on the ornate signs that depict the heritage, history and culture of the villages that put them up (normally on the village green). 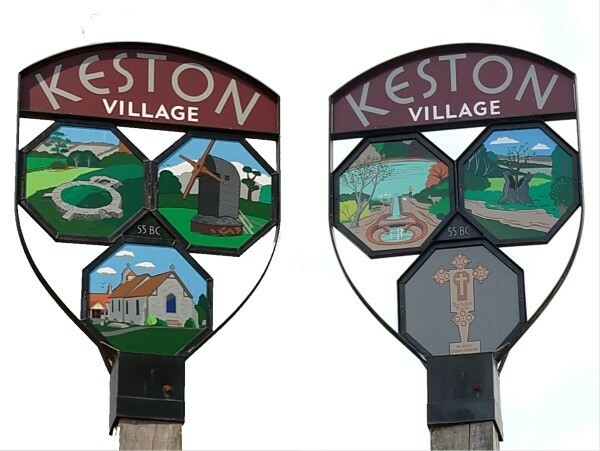 Keston's village sign was the last one erected by local villages. Keston village is part suburban and part rural, lying in the London Borough of Bromley, but historically part of Kent. The area around the village sign has two of the three pubs in the village and a selection of shops from a corner store through to a supplier of expensive motor vehicles. 55BC - Julius Caesar and his troops camped in the Keston area for 2 weeks in 55BC. Keston Windmill - This mill still stands on Keston Common. Having been originally built in 1716, the upper structure was renewed and the framework strengthened in 1913. Keston had two other mills - a smock mill (the typical octagonal windmill shape) known as Olive's mill, which was build in 1824 and burnt down around 1880, and a mill at Holwood Park. Wilberforce Oak - William Pitt the younger lived at Holwood Park, and was often visited by his good friend William Wilberforce. Wilberforce wrote in his diary about a conversation that he had with Mr Pitt whilst standing beneath an old oak tree looking out upon the Vale of Keston, stating that, “I resolved to give notice on a fit occasion in the House of Commons of my intention to bring forward the abolition of the slave trade." Not much of the original oak tree remain, but a new one has been planted and the spot is commemorated with a stone bench "Wilberforce seat". Keston Parish Church - Keston's small medieval church was built in 1216. It is not dedicated to a saint, but built into the altar-table is the top of the 17th century altar inlaid with a very elaborate cross - see below. Roman Burial Monument at Warbank - In the valley below the village are the ruins of a complex of 3rd century AD Roman tombs and mausolea. Keston Parish Church Cross - Inserted in the altar at Keston Parish Church is part of the top of a 17th Century communion table which is inlaid with an elaborate cross, which is inscribed 'The Keston Marke' and below this 'In Hoc Signo Vinces' (In this sign shalt thou conquer). The Cross is now displayed on the wall to the left of the sanctuary. Caesar’s Well - is a natural spring on Keston Common that feeds its three ponds. When Caesar was encamped here, his troops were in great need of water, and none could be found in the vicinity. Observing that a raven frequently alighted near the camp, and assuming it was for water, he tracked down the spot and discovered the spring, gaining a supply of water for the Roman legions. From the circumstance of its discovery, the spring was called the Raven's bourne or brook - now the name of the river fed from the ponds. Be careful, you will need to cross a road to get to the cache.